Radical violence associated with the Cultural Revolution began in the universities and secondary schools of Beijing, where fanatical students, calling themselves Red Guards, responded literally to Mao's call to "bombard the headquarters." Brainwashed by the Communist system and encouraged by Mao, they attacked certain teachers and administrators who they believed were hostile to Mao and his ideals. 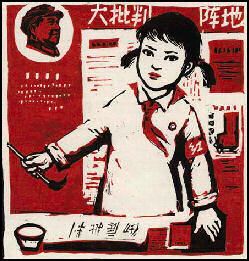 The May 1966 poster by the philosophy professor Nie Yuanzi is credited with launching the Red Guard Movement. Many students, whose "suspect" revolutionary background denied them opportunities, embraced the Red Guard movement as a way of showing "they could be as revolutionary as their parents" and as a means of exacting revenge against party members who had discriminated against them. In August 1966, Mao stood in Tiananmen Square before one million Red Guards, many of them waving Little Red Books and chanting slogans like "Down with the Four Olds!, Up with the Four News!, New Thinking! New Customs! New Habits." In February 1967, Red Guards led 3 million peasants into Shanghai for a pro-Mao rally. 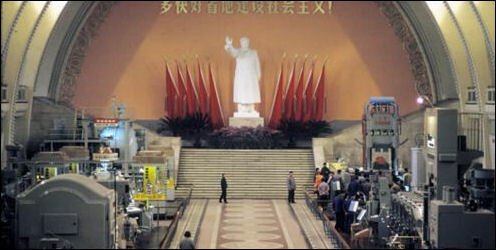 Mao met with hundreds of thousands of young people in Tiananmen Square in Beijing 8 times during the Cultural Revolution. Later the Red Guard movement spread to provinces and villages across China where local committees, encouraged by Red Guards imprisoned, tortured and murdered a surprisingly large number of "class enemies," tried by "peasant juries" in kangaroo courts. The Red Guard movement ousted municipal party members in Shanghai in January 1967 and eventually shut down the entire Chinese educational system. Many of the "class enemies" were simply victims of violent score-settling in the absence of an impartial police force or an independent legal system. 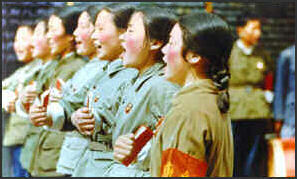 The Red Guard was made up mainly of high-school- and university-age youths. They wore red armbands that read: “Red-Color New Soldier.” In her book Wild Swans, former Red Guard Jung Chang wrote, Mao wanted to establish "absolute loyalty and obedience to himself alone," and to do this he needed terror. "He saw boys and girls in their early teens and early twenties as his ideal agents" because they were easy to manipulate. One woman, now an editor of a magazine in Hong Kong, told the Washington Post, she joined the Red Guard when she was 18 "because I felt it was a glorious thing to do...In the beginning I had no independent thoughts. I thought what the Communist Party asked me to think. I did what the Communist Party asked me to do. But I saw close friends who could kill or be killed in a very inhuman way. I began to have doubts about our system and our government. I learned that very kind and even gentle people can change personality in such a situation. Some of the gentlest people became very cruel." Then, she says, came "something so horrifying I will never be able to forget it as long as I live". There is no doubt she is still traumatised, and her voice rises to a shriek as she describes it. "It was dark---I was standing by the side of a road, waiting for my friends. I heard someone whispering for water and saw a man crawling towards me from the basketball court," she says. "He was covered in blood. The blood on his head had congealed already. I was terrified. Then I saw the court---it was almost covered by dead bodies." All, she believes, beaten to death by Red Guards. Yet, for these teenagers, it was a heady as well as a frightening time. Hours after witnessing the atrocity, Yu was on a train to Shanghai. They were travelling first to spread the cause---bearing leaflets titled "Long live the red terror"---but then "it just became travel and leisure". Trains were free to Red Guards; food and lodgings awaited them. "There were no plans, no destinations” I was just very happy." "The Red Guards who were most active had [political] problems in their family and tried to prove they were different," she suggests. "Every time we get together, I look for the people who were most brutal. One told me it was exciting to go to people's houses and smash things and beat them up. You felt you could do whatever you wanted---that you were in control” And you thought it was the right thing to do." In clinical dispassionate language he describes how he became sucked into the anarchy going on all around him. "At first we were reluctant to beat others, but someone would criticise us … Finally we loved to beat others. Killing became very common at the time when people treated fighting as fun. It was natural to kill people in such circumstances," said Wang. On August 5, 1967, Wang became a killer. His victim was another student from a rival faction. "I beat the back of his head with a rod. The rod was thick and hard, very long about 1.6 meters long, similar to the handle of a big hoe … I beat his head and broke the back of his skull. The police later told me that one blow was enough to kill a person with such a rod and with my power." Wang was arrested, but later freed after the family of the dead student forgave him. He finally made a full apology in 2008 and is urging others who killed to confess. "Few people will understand what the Cultural Revolution was if we all hold back the truth," said Wang. "I think the true nature of that time is made up of memories and stories of the participants who clearly know what happened. Someone has to tell the truth, or our generation will have failed. That is why I spoke out." Violence and death caused during the Cultural Revolution is now believed to have been more widespread than previously thought. 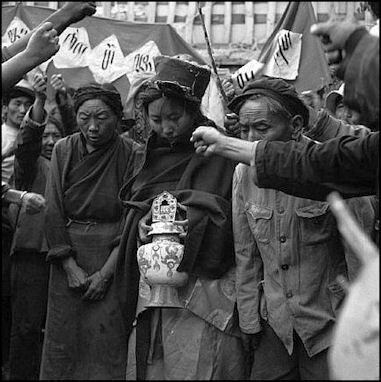 Scholars originally thought that most of the violence ended with the suppression of the Red Guard and rebel organizations in 1968. Scholars now believe that two little-known and little-studied campaigns of the Cultural Revolution---the "Purification of the Class Ranks" (1968-70) and the campaign against "May 16 Elements" (1968-69)---were among the bloodiest events of the Cultural Revolution. Chengdu was the site of brutal street fights between factions of Red Guards. Zhang Jingyan, a retired art-history professor in Chengdu who was 12 when the Cultural Revolution broke out. told The New Yorker,"I went to watch, and it was terrifying. I watched people being thrown off buildings," she said. "I couldn't move or run away. I was completely frozen by it. And then I felt ashamed: Why don't I have more class consciousness? These are the enemies of our class! How come other people are capable of hitting them, and I'm not?" But Professor Zhou Daming, who was sent to labor in the fields at 16, said the new exercise was completely different. "We had barely graduated from high school. We did not even have the most basic knowledge about many things. The experience was good in that it taught me to 'eat bitterness'. Everything that came afterwards did not seem challenging or impossible anymore. I think this experience---especially now that I am doing social study work---broadened my view of society." So why did reason not prevail? Walder explains that the calls to curtail violence ran directly counter to the views of the CCRG. Jiang Qing had given an early nod countenancing violence on July 28, telling high school Red Guards that we do not advocate beating people, but beating people is no big deal. 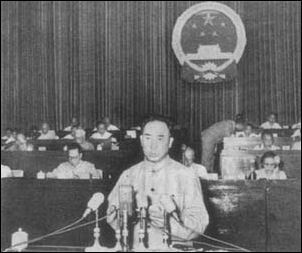 Later, Mao told the Politburo Standing Committee that I do not think Beijing is all that chaotic. . . . now is not the time to interfere. . . Taking his cue from Mao, Xie Fuzhi, minister of public security, set the official line: I do not approve of the masses killing people, but the masses ---bitter hatred toward bad people cannot be discouraged, and it is unavoidable. The local police and army were ordered not to intervene when Red Guards were on the rampage. Walder now shows that not only did many Red Guards dislike the violence but that---after the first protests by the picket corps had been stifled---a minority of independent-minded dissidents began to develop a new critique of the ultra-left CCRG leadership which identified the taste for violence as one of that leadership’s unprincipled weapons. Alone among students at this point in Chinese history, says Walder, they had a realistic view of what was actually taking place, while the [officially approved] “rebels” were conforming to CCRG authority and wrapping their actions in a fantasy language of conspiracy and rebellion.